The Life of Hinduism brings together a series of essays—many recognized as classics in the field—that present Hinduism as a vibrant, truly “lived” religion. 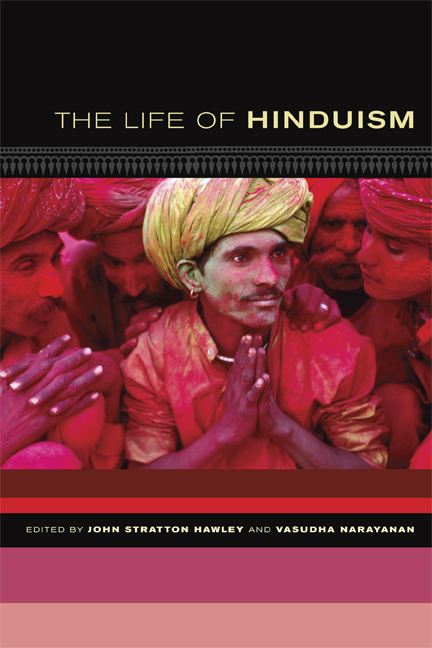 Celebrating the diversity for which Hinduism is known, this volume begins its journey in the “new India” of Bangalore, India’s Silicon Valley, where global connections and local traditions rub shoulders daily. Readers are then offered a glimpse into the multifaceted world of Hindu worship, life-cycle rites, festivals, performances, gurus, and castes. The book’s final sections deal with the Hinduism that is emerging in diasporic North America and with issues of identity that face Hindus in India and around the world: militancy versus tolerance and the struggle between owning one’s own religion and sharing it with others. John Stratton Hawley is Ann Whitney Olin Professor of Religion at Barnard College. He is the editor of Saints and Virtues and Devi: Goddesses of India (both from UC Press), among other books. Vasudha Narayanan is Professor of Religion at University of Florida. Her books include The Tamil Veda: Pillan's Interpretation of the Tiruvaymoli and The Vernacular Veda: Revelation, Recitation, and Ritual.